Today, disability support providers House with No Steps and The Tipping Foundation announced their merger. 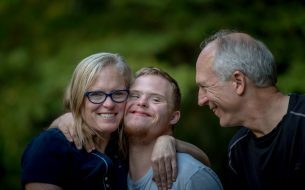 Social Ventures Australia Consulting director Malcolm Garrow, who led the SVA team that supported the organisations during this process, praised the providers for their focus on improving outcomes for people with a disability. ‘Congratulations to House with No Steps and The Tipping Foundation on today’s announcement of their merger,’ Garrow says. ‘SVA has been privileged to support these committed organisations through the process of exploring and developing the rationale for the merger, and then planning its implementation. “We applaud their focus on improving outcomes for people with a disability, which has been the driver for this project. Visit www.hwns.com.au to hear more about the merger. For media enquiries please contact Tambelin Boykin (tboykin@socialventures.com.au) or Kye White (kwhite@socialventures.com.au). For more information on SVA’s work on the merger please contact Malcolm Garrow.